Karen: I don't have to imagine - I'm doing my part of the review using the actual issues! Doug: For practicality's sake I am reading and scanning for these two posts (Adventure Comics #370 will run on Friday) from the Legion Archives, Volume 8. Thanks to the powers that be at DC, for a new Legion Archives is finally in the offing -- it's been far too long since Volume 12 came out. Look for Volume 13 coming in the spring of 2012. 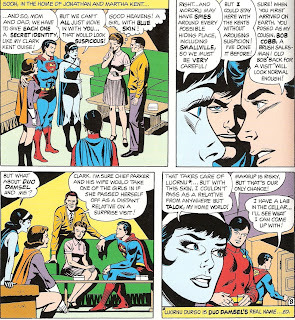 As I said above, enjoy the Curt Swan art in these two issues -- Swan always made the Legionnaires look like the teenagers they were supposed to be. And how about that splash page? The first appearance of Mordru the Mystic is a truly frightening image! Karen: It's a very exciting, dramatic cover. 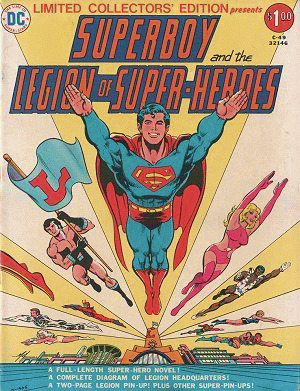 I like the Grell on the treasury cover, although that's some poor foreshortening on Superboy. The splash page is excellent -you know it reminded me a lot of Barry Smith's Conan work! Doug: It's certainly more detailed that anything else we'll find inside. Here's another thought -- although the Archives were restored in terms of color, I'm glad they used the same palette as in the original books. Any notion of shading is done strictly through the inks. It makes me glad in this case that they kept true to the originals. Doug: We open with four Legionnaires in trouble. 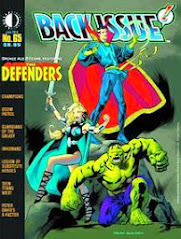 Mon-el carries a wounded Superboy, as Duo Damsel and Shadow Lass assist. Shadow Lass had only been around a short time (her 1st appearance was in Adventure Comics #365), so she was pretty clueless through the first scenes. Mon-el quickly tells Duo Damsel to program the Time Cube. As Mon gets in last, we see an ominous figure enter the time travel room. But, when they leave the timestream Superboy is back to normal -- and he isn't happy! Seems in the panic, Luornu programmed the Time Cube for Smallville in Superboy's time. We then get a recap of what all had just gone down. Karen: Seeing the Legionnaires fleeing was quite striking. It captured my interest for sure. Doug: Shadow Lass was exploring the Legion's new HQ (a definite upgrade from the "crashed spaceship" building), when she came across a heavy vault. Curiosity got the best of her (as was typical of all failing females in the Silver Age) and she began to turn the wheel to get inside. Mon-el came upon the scene and stopped her. He then related a tale of adventure where the Legion had fought one of the most dangerous enemies in their history -- an all-powerful evil wizard named Mordru. Mordru had managed to conquer all of the planets on the outer rim of his galaxy, with many planets just caving in at the mention of his name. The Legion chose to challenge him, and were nearly defeated before Superboy and Mon-el encased him in an impenetrable steel vault. But as Mon and Shady look at the vault, Mordru's arms suddenly burst through the side of his tomb! Karen: I thought the Mordru backstory was really impressive. 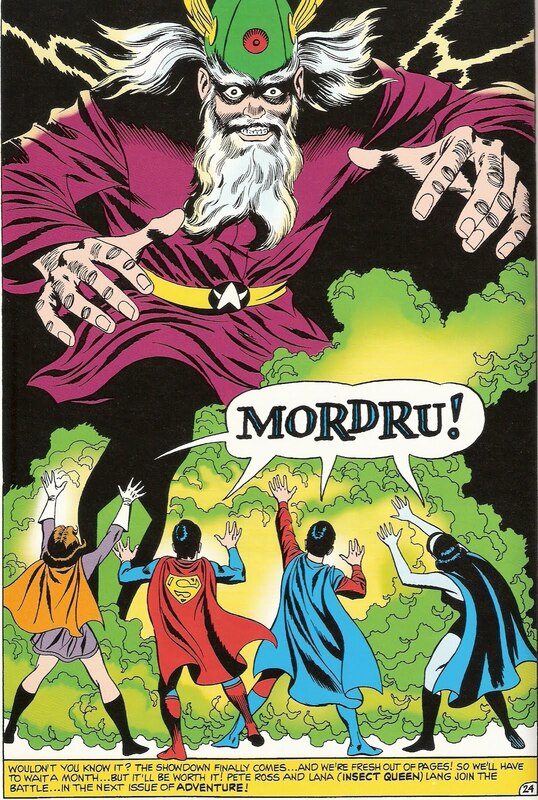 The idea that the free worlds stood back and did nothing against Mordru until it was too late was all too familiar. Doug: Now on Earth in the 20th Century, Superboy laments that this may be the first place Mordru will look for them. I've read over this section several times, and can find no clue as to why they feel so certain that Mordru will come to Smallville. I suppose the Time Cube could have been set by a visible gauge or something, but there's just no evidence that Mordru knew anything about Superboy's life in the 20th Century. And you know what else I got to thinking? 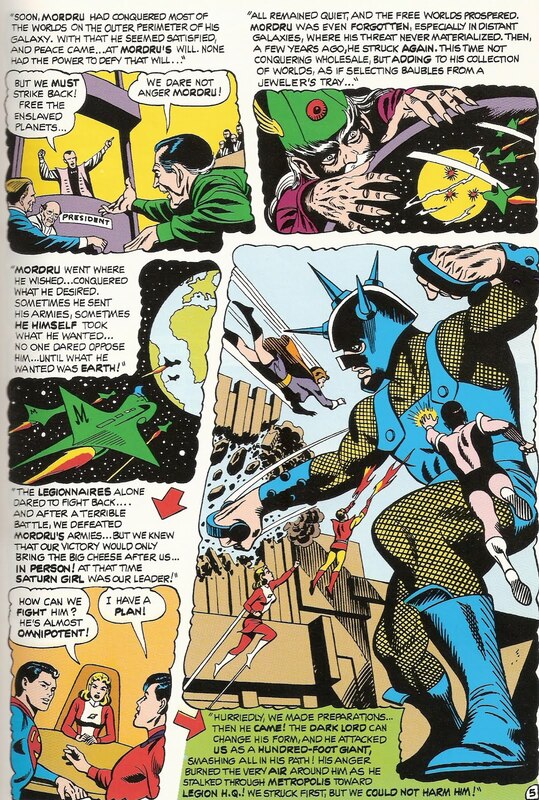 If this Mordru cat was so dangerous, why the heck didn't they just set the Time Cube to about 10 seconds before Shadow Lass started messing with the vault door? Duh... But then we wouldn't have this cool story, would we? Karen: I don't know exactly why they assume Mordru will go to Smallville, other than the idea that in the future, people know where Superboy is really from. But yeah, who cares, on with the story! Karen: Bob Cobb...that's just so wrong. 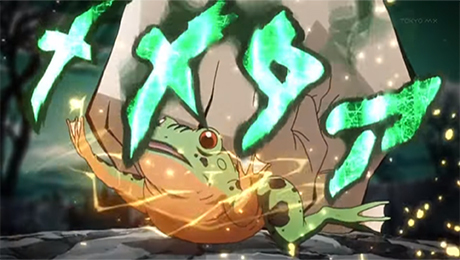 One of the most powerful beings in the universe, a brush salesman? Talk about demeaning. And how different are things today -if a kid showed up on my doorstep claiming to be a distant cousin, I'd suspect they were lying and up to no good, and send them on their merry way! Doug: As everyone settles in, they suddenly feel the presence of a thick darkness passing over Smallville. 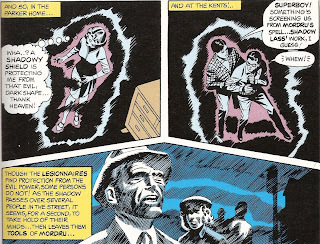 All four Legionnaires determine that it must be the presence of Mordru, and all attempt to clear their thoughts. 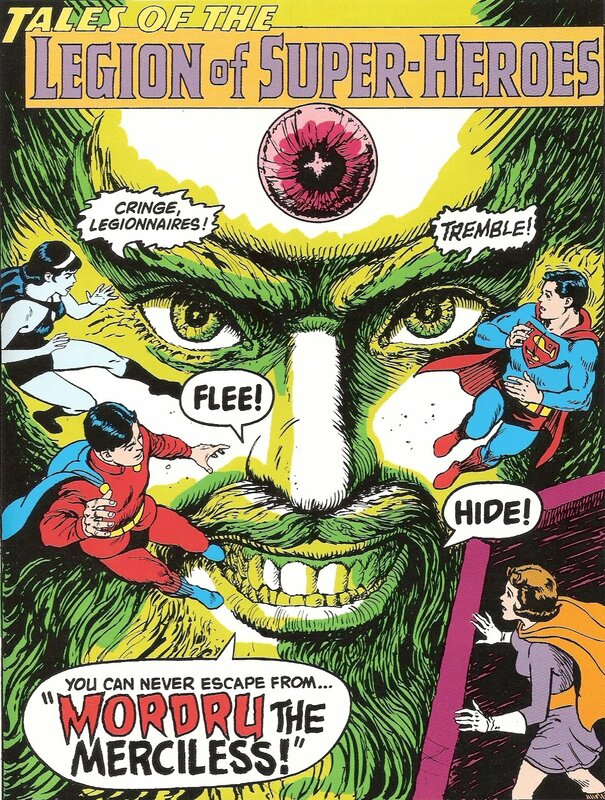 It's Lana who is struck down; possessed by Mordru, she is forced to let her eyes become his eyes. She passes out, but "Betsy" revives her quickly. Shortly, the four heroes meet in the Kents' cellar to plan. They decide that they must stay hidden for the time being, not even to talk to each other. As they disperse, Duo Damsel hints that she'd like to be walked home -- after all, it's the middle of the night. Stodgy old Clark, though, he has a plan... He shows her a tunnel that will bring her out in the woods adjacent to the Parker home. Gee, thanks Clark. 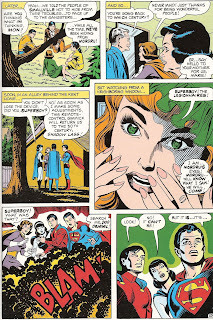 Luornu is ticked, as she'd certainly liked to have been "noticed" by Superboy. Karen: The Legionnaires didn't have much of a plan here -actually no plan! "This is it...our last meeting! After this we just fade into Smallville and forget we were ever Legionnaires until someone comes up with a plan to battle Mordru!" Somehow, I have a hard time imaging the JLA saying that. Duo Damsel's fixation on Superboy -and cattiness regarding Shadow Lass -was a hoot. Doug: Mordru's next trick is to create illusions in an attempt to bring the young champions out of seclusion. Floods, monsters, etc. all menace Smallville, but the young guns keep to their oath of staying hidden. All is going well until "Betsy" loses a little make-up off her arm. As one of the jokers in the classroom draws attention to it, Clark acts quickly and shoots a bit of blue ink out of his fountain pen (see, 1958... no one in 1968 was using a fountain pen, ya think?) and everyone seems to buy it. Then on the way home, two trucks suddenly careen toward one another. 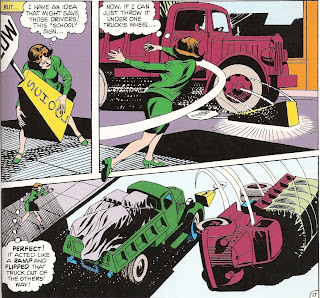 The boys are helpless to use their powers, but Duo Damsel (in a display of powers I certainly didn't know she had) picks up a concrete-based stop sign and hurls it under one of the trucks -- effectively creating a ramp that tips it over and evades the potential crash scene. I'm sorry -- isn't she just able to split into two normally-powered girls? But crime also begins to go on the rise with no Superboy in sight, and the teens and townspeople begin to get antsy. Cue "King" Carter and his gang. Karen: I thought it was interesting that of all the Legionnaires, Mon-El was the one who kept his cool and realized they were seeing illusions. Am I just imagining it, or was it indicated that he was a little older than Superboy? I don't now why Duo Damsel would have double strength, but she certainly got Superboy to look at her in a new light -"I never realized Duo Damsel was so pretty before!" Uh oh -we don't need any changes to the time stream! Doug: A group of mobsters stroll into town and begin to terrorize the locals. With the townsfolk powerless, they get the run of the place quite quickly. But our youths are still heroes at heart, and with the help of Pa Kent and others who aren't happy with this turn of events, a revolt is staged which defeats the mobsters. Debriefing afterward, our stars decide that it's hypocritical to have encouraged the denizens of Smallville to face their demons while the Legion runs from theirs. Donning their costumes, they are almost immediately seen by Lana Lang -- who is the eyes of Mordru! Karen: The whole mobster thing was extremely silly, but it was good to see the kids come to the conclusion that they needed to go after Mordru, not hide from him. The panel with Lana serving as Mordru's eyes was very effective. Next issue should be a heck of a showdown! Oh wow that cover brings back memories! How I loved that comic. It was one of my first Legion comics. Unfortunately, I've lost all of my treasury sized comics. :-( I think my father threw them out when I went away to college. I'll have to try and get them back, some day. Oh my, yet another 'holy grail' uncovered.. I LOVE the Neal Adams Superboy covers, I have for a while now. I love the striking boldness of colors and simple layout on his covers, Superboy issues are some of his best. My trips to coverbrowser.com to see these Adams covers have been like going to the candy store. 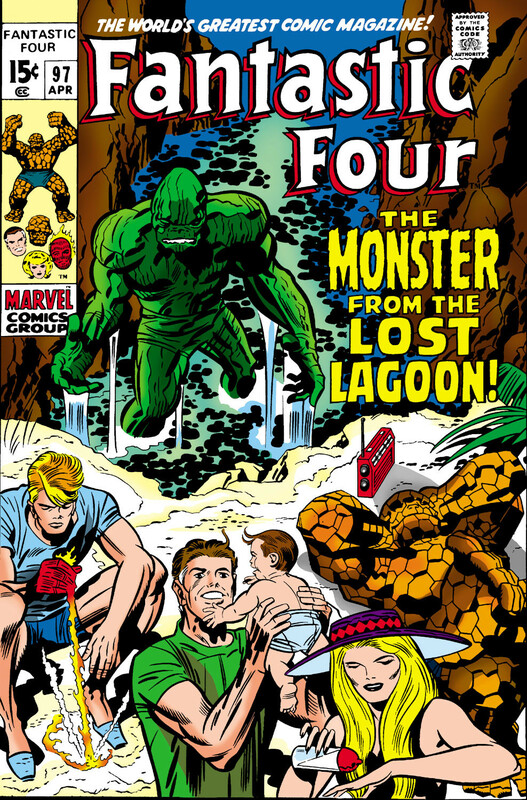 I love those late-Sixties Adams covers; I also get a huge nostalgic rush for the Adventure logo: the Legion as I first knew it. In the thirty years since I first got that issue of Adventure at a comics mart in Glasgow, I've wondered if the "Betsy Norcross" disguise was a foreshadowing of white-skinned Shadow Woman. And yes, I always thought Mon-El was Superboy's " big brother", three or four years older. 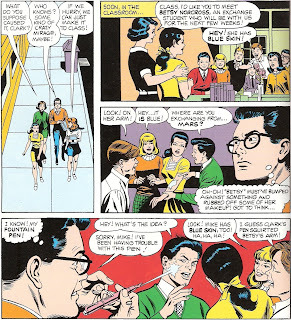 Duo Damsel's pining over Superboy was young Jim Shooter's effort to inject Marvel-style teen age angst into the Legion. Smallvile was "stuck" in 1958 because it was 1958. That's when the Superman of 1968 would have been a teenager. Hmmm ... I have never been a big Curt Swan fan. I usually find his stuff pretty bland, the embodiment of why Marvel was able to eventually usurp DC's place as thetop company. 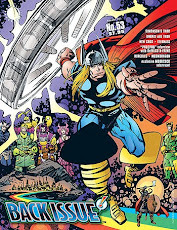 Just this weekend I brought a discount bin copy of DC Comics Presents #56, which he penciled. It seemed like hackwork and put me to sleep. Having said that I cannot find any fault with his work in the scans you posted. In fact, some of the panels - like the one with the three faces tightly drawn together - are ingenious compositions. 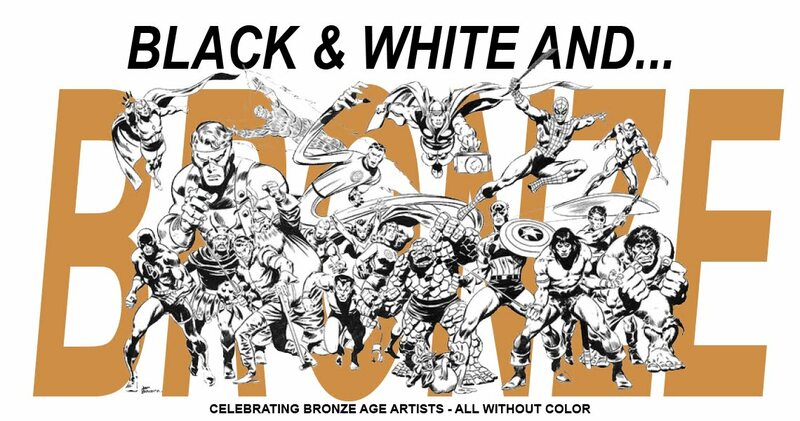 Maybe I have been too harsh by judging Swan mostly on his latter-day Bronze Age work. Anybody else have any thoughts on Swan? That's a good point about 1958 - obviously I'd not considered that. Makes perfect sense! For me, Curt Swan is just so much better than any of the earlier Superman artists (Boring, Schaffenberger) that I've always liked him most. Like I said in the post, the Legion looks like kids, which others missed. Swan was a master at facial expression as well. But -- would he have been a "fit" at Marvel? Probably not. I'm not sure if anyone here is checking out the Adventure/LOSH comics from about the last year (2010-11), but Levitz' new Legion stuff has been some of the best (and only) new comics i would recommend these days. And i just picked up LOSH #1 from the DC re-do, ,but i haven't read it yet. 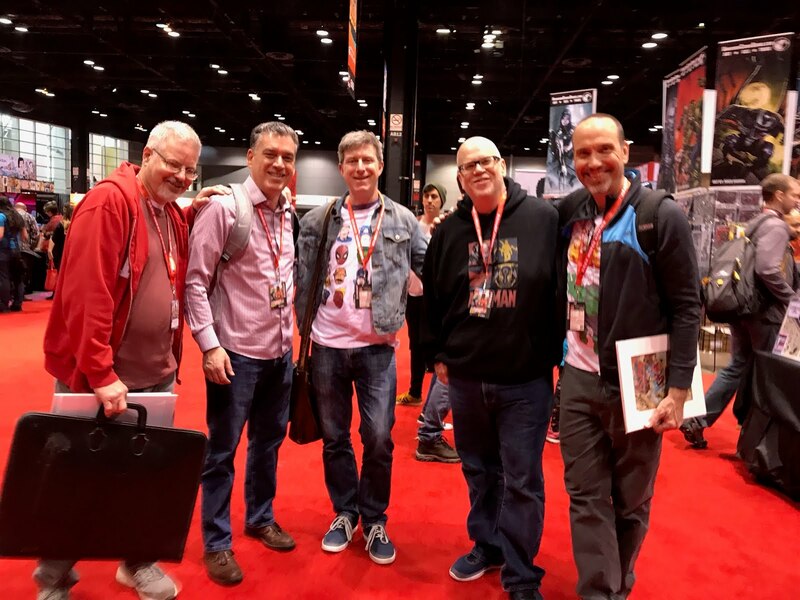 Thanks for the Legion-centric blogs; as I've stated, the Legion (and Legion Academy) are some of the only current comics i am reading these days. The original of this was one of the first superhero comics I owned. (I more typically bought Archie or Casper.) I reread it endlessly as a kid, in part because I didn't own the next issue, so reading it left me in such an excited state of suspense. Thanks for bringing back a favorite memory (though I suspect I have the issue upstairs somewhere and could revisit those memories more effectively); I'm looking forward to the conclusion! 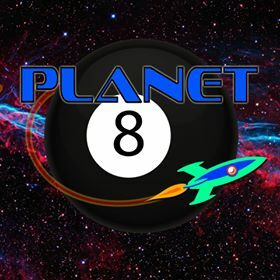 The scene with Duo Damsel throwing the school sign caused a misconception. Some fans assumed that she had the strength of two people when in her singular form. Adding weight to that theory is Clark's quip that a person's strength can briefly "double" in an emergency. But there is no indication elsewhere-in stories or in profiles of Legion members in text pages-about her having double strength. Commander Benson's blog (Feb. 23, 2010) pointed out that an athletic young woman could lift that much weight without super powers and that the Legion presumably trained and worked out regularly. Clark's remark was typical. Often, Golden and Silver Age stories ended with a hero winking at the audience and making some in-joke that readers understood but that the other characters (who, of course, didn't know the hero's secret identity) wouldn't get. One of the truck drivers speculated about how, in an emergency, people can sometimes do things "beyond their normal strength." So maybe the idea was supposed to be that Duo Damsel had a power surge from adrenaline. 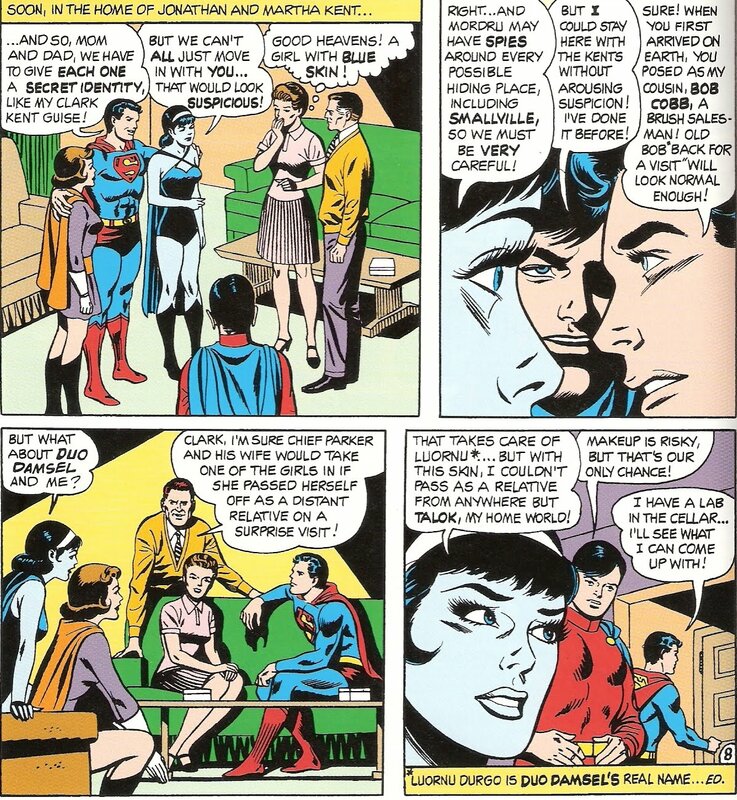 Then Superboy/Clark made a pun out of it with his remark about "double" strength. Bob Cobb later appeared in a "Seinfeld" episode, he was also known as "Maestro"
The splash is a RARE example of Swan's own pencils and inks. @Inkstained: glad you're finding things you like in the work of this outstanding artist. Swan is at his understated, expressive best in the '60s & '70s on the LEGION and SUPERMAN strips, inked mostly by George Klein and Murphy Anderson. I recommend his late LEGION of the same vintage as this sample and SUPERMAN # 233-270...particularly # 233, 241-242, 248 and 251. Curt Swan was a much better cover artist than he was as an interior artist. 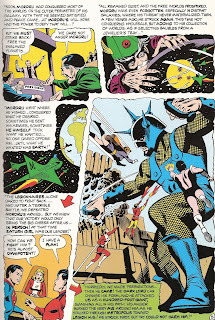 Still teamed with the right inker, such as George Klein, he could still pack some powerful storytelling into his comics. By the 70s and beyond, however, a sameness took over his artwork and you could see him just pumping the stuff out with no enthusiasm. His Legion work always seemed inspired. So, Who Got It Right? So, How Deep Are You?